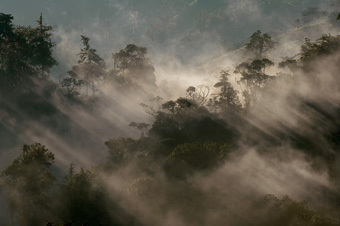 Rainforest Concern’s Forest Credits carbon offsetting programme is based on halting the destruction of natural forests, in particular the native rainforests of Latin America. Offsetting is a way for all of us to take action on climate change by taking responsibility for our carbon footprint and supporting emissionreduction projects. CO2 emissions and other greenhouse gases occur everywhere and all the time from everyday life, such as driving, flying, industry and agriculture, and heating our homes and offices. Standing native forests are a very important store of carbon and if they are destroyed much of this carbon will be released into the atmosphere. It is therefore essential to protect them. Responsible offsetting means reducing your emissions first, then balancing your remaining emissions through the purchase of offsets, which are measured in tonnes of carbon dioxide equivalent (tCO2e). Forest Credits concentrates on areas of exceptional and threatened biodiversity in Central and South America. Our vision is long-term, and apart from securing the forest, we help local communities understand the importance of their natural environment and find alternative sustainable income now and in the future, for the continuing safeguard of these forests.